Season 7: Our 2019 opening day will be Tuesday April 23rd!! All of us at the New Brunswick Bike Exchange are looking forward to seeing you this cycling season! The New Brunswick Bike Exchange is a non-profit organization run by the efforts of volunteers who collect, recondition, and sell used, quality bikes. The NBBX offers an ever-changing selection of low cost bikes for riders of all ages, from occasional recreational riders to frequent riders and commuters. All bikes are fully assembled, operational, and available for test rides before purchase. Our mission is to promote a healthy and active lifestyle through cycling while raising money to support PRAB’s various community services. We are located at 90 Jersey Avenue in New Brunswick. The entrance is at the rear of the PRAB building through a garage door in the rear parking lot. If you have bikes to donate, please e-mail Leighann at leighann.kimber@gmail.com to discuss any arrangements. Check out our Useful Links page for bike registration advice. Organize and/or host a bike drive in your community, workplace, church, boy/girl scout troop, or other community and service oriented organizations. If you can put the word out to your community, we will provide support for the drive including brochures, fliers, and transportation to get the donated bikes back to our warehouse. Volunteer in our shop, located in the warehouse at PRAB’s 90 Jersey Avenue facility. No mechanic experience is necessary and there are a variety of volunteer roles. We need cashiers, salespeople, accountants, mechanics, and bike drive coordinators. Check out our Volunteering page for more details. Have any more questions? Send us an email at info@nbbikeexchange.org and we’ll get back to you as soon as we can. 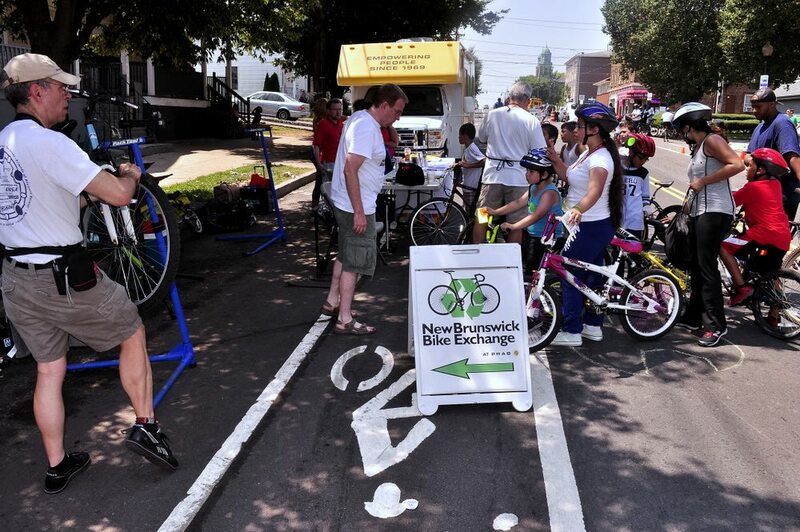 If you want to host a bike drive, contact us at drives@nbbikeexchange.org. PRAB is a Human Services Organization in Middlesex County, New Jersey that provides a comprehensive range of essential services for children, youth, families and senior citizens. For more information on PRAB, click their logo. Hope to see you around the shop!